Number 25, Kristi, will receive the $50 gift certificate to Wheat and Wildflowers. A few weeks ago I shared the beautiful dresses that the talented Robin at Red Thread Stitches had made for the girls, today I am going to share another gem that I stumpled upon. Actually, I did not really stumble upon it, the owner/designer took one of my online photography classes and I had the pleasure of getting to know her personally. Kim, the owner of Wheat and Wildflowers, is a beautiful person inside and out. If you know her or take a few minutes to browse her site, you will see that she has big a heart for the children of China. Not only is Kim an adoptive Mom, but she also has her business set up to give back to those left behind. She has designed necklaces for specific charitable organizations such as; An Orphan's Wish, Grace & Hope for Children, Love Without Boundaries, and Henan Kids International. She offers a LARGE selection of handstamped jewelry, and will even personalize something for you......as she did for me with my "Visions of Hope" necklace. I love this necklace so much and wear it as often as I can. To me it is a constant reminder of Reagan, her beginnings, the children that are still waiting in China, and the project that I have been working on this year. It is a very special piece that I wear proudly. The minute the piece arrived, I emailed Kim to thank her for designing such a gorgeous necklace. I told her that I wanted to share it here with you all and she sweetened the deal. Did I mention that she has a GIANT HEART? She is offering anyone who reads my blog a coupon code. By using this code at checkout, you will receive 10% off any purchase. She is going to giveaway one $50 Gift Certificate to be used for the piece of your choice!!! I am SO EXCITED to be able to host this giveaway! If you would like a chance to win the $50 gift certificate, please leave a comment here before Sunday night at 9pm Eastern Time. We will pick the winner next Monday! To visit Kim and see all of her beautiful creations, click HERE. That is a beautiful necklace and perfect for you. Beautiful necklace! So sweet to have a giveway! I love handstamped jewelry your piece is beautiful. On my way to Kim's site now. Just went over to her web site...oh my gosh!!! Beautiful, every single design. And your necklace is stunning! Love your Friday finds series. Necklace is just beautiful. I have a granddaughter from Henan. Would love to be a lucky winner of the cert! Love reading your blog and miss when you are just so busy you aren't able to write one. Beautiful! I'd love a chance to win. Definitely going to head over & check out her stuff right now. Lisa, every time I look at that necklace, my eyes fill with tears!!! Beautiful necklace. Sounds like she had a beautiful heart. That necklace is beautiful! I love the camera! Kim must be so talented. Love it...... what a gorgeous necklace. I've been drooling over her creations for months! :) Love them! I just fell in love with this type of jewelry when I went to a craft show...and I she does an amazing job at it! I love, love, love my Wheat and Wildflowers necklace and wear it all of the time too. What a fun giveaway! Love it! I would love to have that camera necklace!!!! Pls count me in the chance for one of these beautiful necklaces!! Also, I have been thinking of you a lot lately and what you have shared about Reagan. I think it's great that you followed your gut, always advocate for her despite what Dr.'s or well meaning friends may say to you (I constantly heard, don't be silly, she's fine, etc.). I know how hard speech concerns can be... You know our Viv is non verbal, so pls email me if you'd like to converse more. I've worked with Kim for Grace and Hope and she is an amazing woman with a huge heart! Her jewelry is so fun to wear! Love the camera design too, thanks for all you do also and for sharing your vision. Love the necklace thanks for all these wonderful finds. What a great website.. Had to pull away to come back ere and comment! Thanks for sharing and hosting the giveaway. Enter me! I love that jewelry! Ooh- I've been wanting one of these for a while now! They are gorgeous! ripples getting wider all the time, good creates good, reflects on good, making the whole world a brighter place. I'd love to enter the giveaway, please! Oh, I love it!!! I'm checking out her site now! just lovely! thank you for the fun! Wow, these are all so beautiful! What a great giveaway; thanks for introducing me to such a wonderful shop! What a beautiful necklace! I would love to have one. From a lurker who has been following your Black and white Wednesdays for quite a while now, such gorgeous kids! 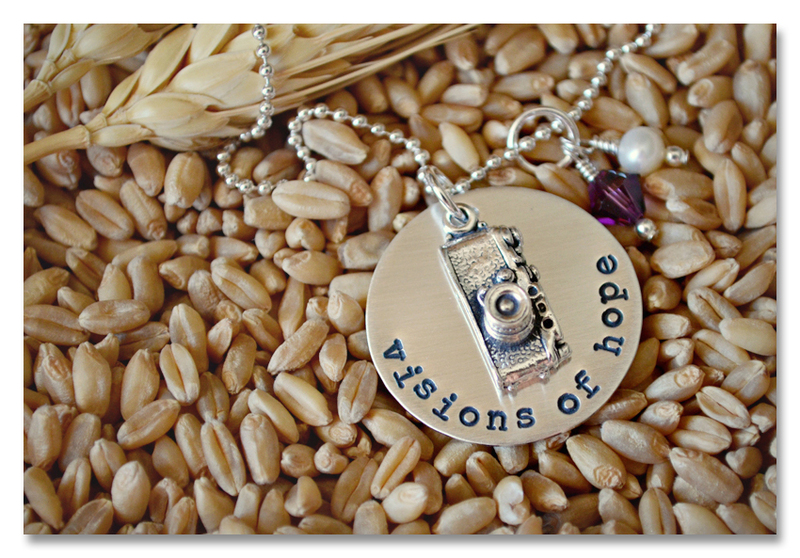 I love the Visions of Hope necklace and of course, mine too!! She does beautiful work!! Just beautiful! I think I am going to have to purchase one of my own, but I would love to win one too to be able to give to a very special lady! I think the handstamped jewelry is beautiful and would love to win the gift certificate. Off to look at her pieces. Its a beautiful way to be creative and I would love to win... to get my own piece with my stepdaughters name on it. Thank you for the giveaway, I have ordered a few beautiful pieces from her. THe quality of her product are priceless. I will have to use your coupon code to order more beautiful jewelry. Thanks for sharing Lisa and YOUR GIANT HEART!!! Lovely jewelry, I would love to win! I love Kim! Our girls' faces are next to each on the wall at CCAI :) she also partners with Henan Kids Internatioonal which is dear to my heart too. And who doesn't love hand stamped jewelry? So beautiful your family is. I LOVE the necklace. I just enjoy your blog so much. Best wishes on the testing for little one. Gorgeous piece!! And yes, a very BIG heart!! Checking out the site now! So pretty! Please enter me in the giveaway. Love this necklace! I have another necklace of her's that says laugh and I wear it all the time! Wouldn't mind another one! I am new to your blog and love the link to the jewelry. I would love to win but also am glad to visit. Love her jewelry, always thought I would buy something but then we keep adding to uor family~ One of these days I will buy a neckalce to represent my beautiful family!! Love this jewelry! Thanks for sharing your great find! I am absolutely floored and thrilled to have won this giveaway. I never win things but I told my mom and she said this is a sign of a change of good things to come!! The funny thing is that I had purchased a necklace as a gift thinking I would never ever win and look what happened. Now, I get to get a necklace with my sweet girl's name on it, and hopefully I can add another little girl's name on a charm in the not so distant future. Thanks so much Lisa and Kimberly. I will be a frequent customer for future gifts! I can't wait to look at Kim's other jewelry designs. Your gift is beautiful...thanks for sharing! Oh darn...I missed this! Congrats to the winner! LOVE this necklace...wow!